Another SXSW has finally come and gone, and even some early risers among us are already gearing up for next year’s events. But in a manner of winding down this year’s SXSW and even prepping for the next, we’ve got the Twitter low down courtesy of Salorix on who to look out for, what party to go to, and what hashtags to keep track of. Salorix tracked all tweets coming out of SXSW Interactive this year both before and after the event. Here’s what they found prior to the start of SXSW. The types of accounts you should follow of course really depend on the type of individuals that you’re looking to network with or are in the industry that you follow. But, here are a few to look out for come next year. Three accounts that were feverishly tweeting about SXSW, and would claim a title for most SXSW tweets, came from @SXSWMidwest, @sxswp, and @stevekrohn. Accounts you’ll also want to follow to get a sense of what SXSW has in store are @sxsw, @ifcsxsw, @sxswpartylist, @rsvpster, and @luckyloungeatx. #SXSW, which is the official South By hashtag of course topped the list. Other popular hashtags include (in descending order) #sxswi, #sxsw2013, #austin, #atx, #sxsw13, and #sxswedu. To give you a scope of how much SXSW was being hyped on Twitter over a period of five days leading up to the start of the event (between March 3 and March 7), Salorix found that 123,995 Twitter users contributed to 280,443 tweets. 21 percent of these accounts belong to brand accounts – namely publishers and media. The rest belong to individuals who are most likely marketing or media-type professionals. The bulk of these tweets came in at around 2PM with the day before SXSW’s opening, March 7, generating the most tweets (79,260). Coming out of SXSW, there’s more data to work with and far more insights on what the Twitter-sphere was raving about. For instance, during SXSW @iansomerhalder, @selenagomez, @jonnyvanmusic, and @AshBenzo generated the most buzz. These accounts belong to celebrities though so their ability to generate buzz in the first place isn’t surprising. Brand-wise, Starbucks, American Airlines, Google Glasses, and Warner Bros were the most talked about on Twitter. And Twitter’s video app Vine is worth mentioning, as the hashtag #vine showed up 14,774 times. With just under 300,000 tweets leading up to SXSW, the volume exploded with 1,166,754 tweets from 434,028 users from professions including music, marketing, tech, design, and media. 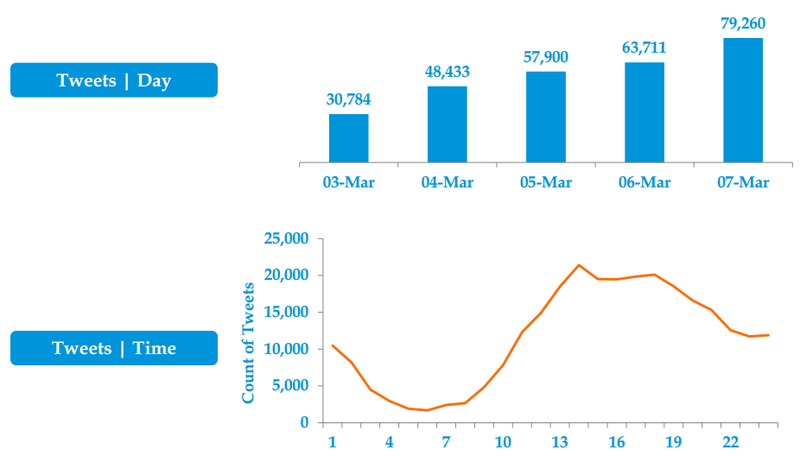 Tweets peaked with 276,497 tweets on March 10, up from 120,862 tweets at its lowest point, which coincided with the first day of SXSW. Then there were an array of platforms that users were tweeting from. 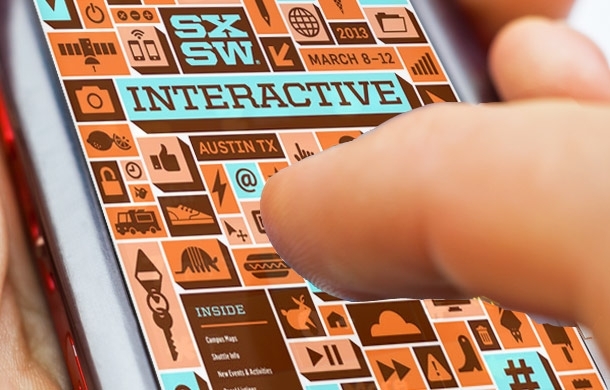 40 percent of SXSW tweets came from mobile devices. 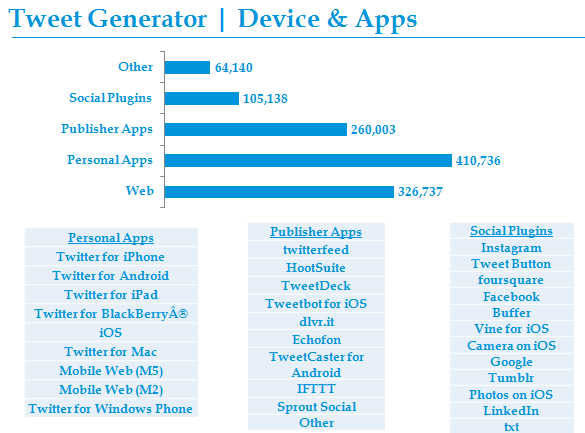 30 percent were tweeted from a Web client, and 10 percent were from other connected social networks like Instagram, Facebook, Foursquare, and LinkedIn.